"Magic of the Violin" exhibition features violins made by violin makers from the town of Kazanluk. 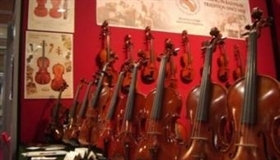 The violin makers are proudly presenting selected violins they have hand made, and some world famous violinists will be playing on them for the Plovdiv audience - Prof. Yosif Radionov and the Ukrainian violin player Oleg Krysa. No admission fee. The exhibition opens at 6 PM, and music fans can see it in the period May 12-17, 2010.